Brew of The Day: 5th Phil-Cosmetics Expo - BE THERE! Hey Coffeeholics! I know it's been a while. Just took a week long hiatus to catch up on a lot of stuff. Also took a break from the online scene. Hehe. But now I'm back coz well, there's so many stuff coming up this end of August plus I have lots of things to share to you guys. 4th Phil-Cosmetics Expo last year with Genn, Tiff, and Gie (not in pic)! 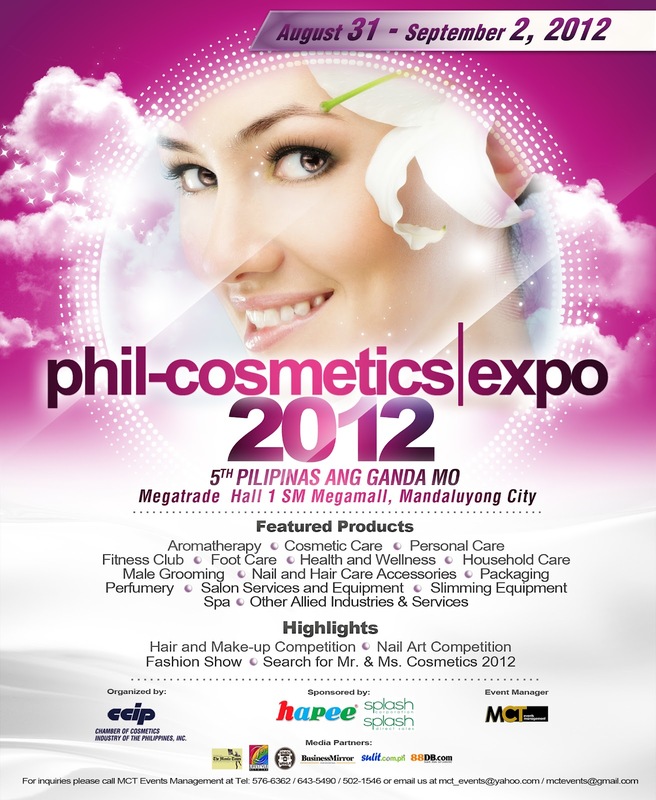 Well one of the things that I'd like to share to you guys is that the Phil-Cosmetics Expo will be starting next Friday, August 31 up to September 2, 2012! I'm so excited about that coz I went this expo LAST YEAR (see my post about that here) and I had lots of fun. I'm betting that this year will also be a blast. Don't miss out in watching (and Joining!) the main events of the expo -- NAIL ART competition, HAIR & MAKEUP Competition, and the FASHION SHOW. I will be posting the rules for the competitions in another post. Anyway, check the press release below to know more about the Phil-Cosmetics Expo on this coming weekend. Know the latest trends in cosmetics. Find a career in beauty. BREAK INTO THE BEAUTY BUSINESS! The CHAMBER OF COSMETICS INDUSTRY OF THE PHILIPPINES INC. (CCIP) will hold its fifth staging of the annual exhibition of leading cosmetics and personal care products on August 31-Sept. 2, 2012 at the Megatrade Hall 1, 5th Floor, Mega B, SM Megamall, Mandaluyong City. CCIP is an organization of companies composed of manufacturers, importers, distributors, traders and retailers of cosmetic products, as well as suppliers of cosmetic ingredients and packaging materials. CCIP is a proud founding member of the ASEAN Cosmetics Association (ACA), the ASEAN federation of national cosmetic associations. This year’s Phil-Cosmetics Expo: 5th Pilipinas ang Ganda Mo! Exposition is also being staged in celebration of the Cosmetics Month in September. Entrance to the Expo is free of charge. Over the years, this Expo has established a loyal and growing market, and has always been one of the most anticipated annual events. For the past four years, this Expo has provided CCIP members and other companies in the same industry, with great opportunities to showcase their products and services to the dynamic market. The Expo has also become a venue for launching, promoting and demonstrating new products and services. It has also proven to be an ideal environment for generating contacts and sales leads, as well as for networking with vendors, suppliers, and distributors. The exhibit goers have also benefited tremendously from the great promotional values and entertainment during the event. This year, the Expo has also opened its doors to the public who are interested in breaking into the business of beauty through its seminars and its exhibitors who offer opportunities other than big discounts on their product lines. Furthermore, the event showcases hair and make-up and nail art competitions and the prestigious Mr. & Ms. Cosmetics 2012 which discovers new talents that represents and supports the objectives of the industry. The event also aims for CCIP members and non- members to interact with each other and establish camaraderie within the industry. For more information, inquiries or reservations, please contact Jonathan Roxas or Emer Dela Cruz of MCT Events Management, the marketing arm of the Expo, at telephone numbers 5766362, 6435490, 3992935 and 502 1546 or thru its email address -mctevents@gmail.com.